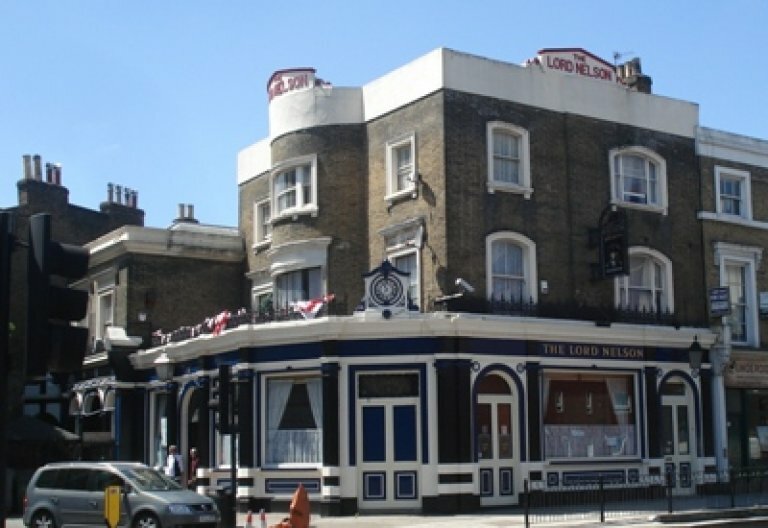 This pub is one of CAMRA’s Real Heritage Pubs (ie on CAMRA’s National Inventory of Pub Interiors of Outstanding Historic Interest) where the description is as follows: “The Lord Nelson was once magnificent - even now it retains some of the most spectacular mirrorwork in the country. Pride of place goes to a large painted and gilded mirror of the great admiral receiving the surrender after the battle of Cape Vincent in 1797 from some shifty, swarthy Spanish types. There are two more vast mirrors behind the servery but one is cracked and the other is largely covered up. The maker was a James Carter of Gray’s Inn Road and they date from around 1888. The details include grapes, kingfishers, vases of fruit and foliage trails. There is also what is probably a unique feature in a pub - an impressive timber arcade striding across the servery with two bays sitting on top of the counter and a third spanning a walkway between two counters. The screen and bar-back have wonderful detail including coloured panels advertising all manner of drinks - champagne, finest old brandies, liqueurs, ports and sherries - the list goes on. The Lord Nelson featured on the Knocked 'Em in the Old Kent Road: Evening Crawl of Bermondsey in December 2010.